Battery Backup or Password Feature? No. Quick History: New Ghostbusters II, developed by HAL Laboratory, was released in Europe and Japan in 1990. However, due to issues with licensing, it was never released in the United States. 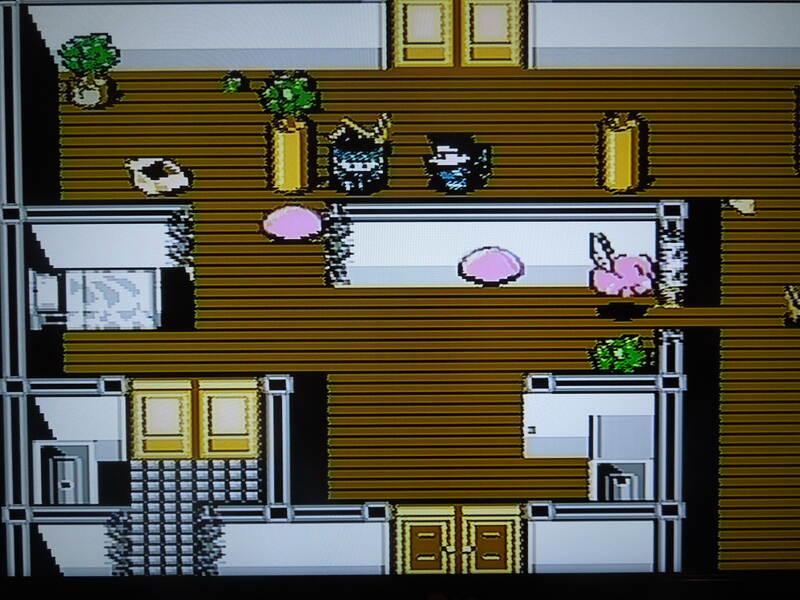 Another Ghostbusters game, simply titled Ghostbusters II, was released for the NES in the U.S., but it was a completely different game developed by Activision. Today, however, reproduction cartridges of New Ghostbusters II have been made that allow U.S. gamers to enjoy this great version of the game that was previously unavailable. NGBII was never released in the U.S., but today, reproduction cartridges compatible with U.S. consoles are available. 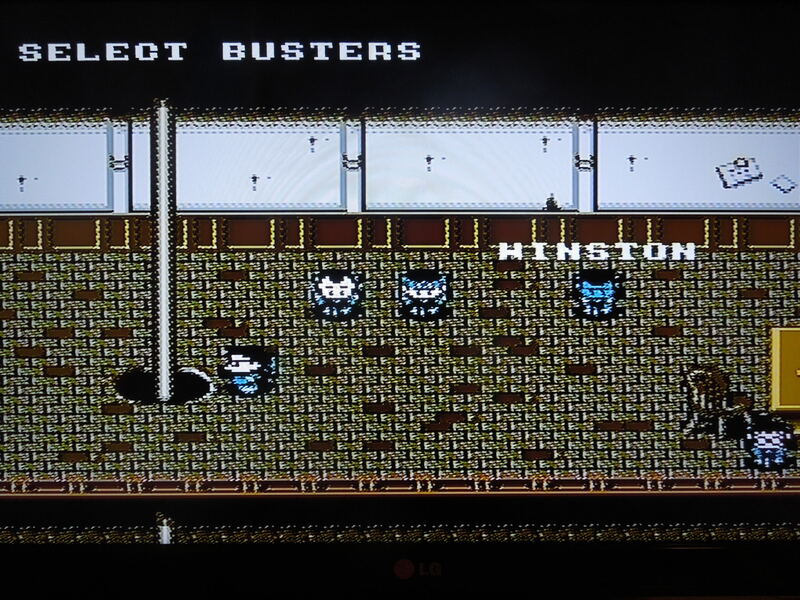 Gameplay: Before gameplay begins, you select from one of the 5 Ghostbusters from the film that was released in 1989: Egon Spengler, Ray Stanz, Peter Venkman, Winston Zeddemore, and Louis Tully. Each Ghostbuster controls the same, so your choice is simply based on your favorite characters. 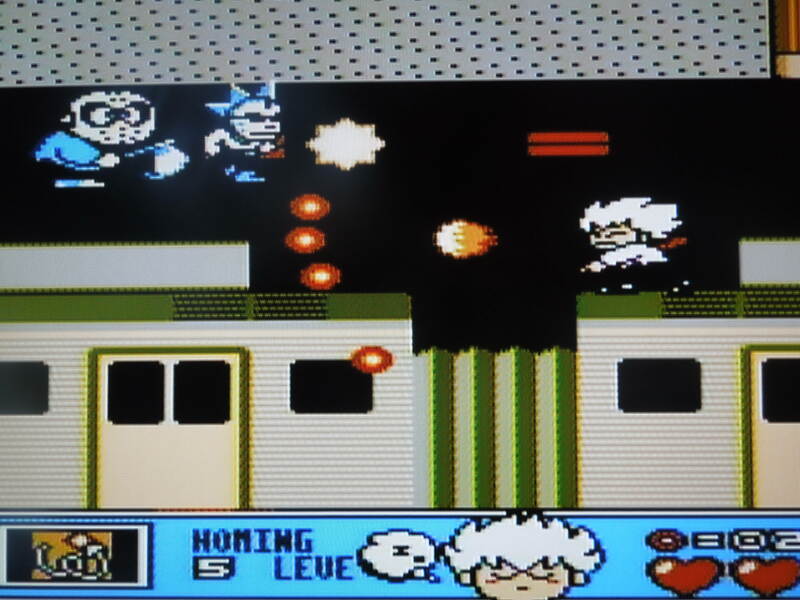 You pick a 2-man team; the first selection will be the primary character you control, whose job is to zap the ghosts you encounter with his proton gun; the second selection you make will be for the secondary, computer-controlled character, who will trail behind you and ‘trap’ ghosts you zap in the ‘ghost trap’ box. Together, you’ll traverse 6 ‘Rounds,’ all of which are made up of locations from the film. In each Round, you’ll travel through multiple screens, zapping and trapping ghosts, in order to advance. The Courthouse, Subway Tunnel, Dana Barrett’s Apartment, The River of Slime, The Art Museum, and Vigo’s Altar comprise the 6 Rounds. Each Round (except for Round 3) has a boss fight at the end, and Round 6 is just a boss fight with Vigo. Only your primary character can be ‘killed’ by ghosts (when they touch you); your secondary character cannot be hit. Select a 2-man team from the 5 available Ghostbusters. Control: You control the primary character completely, and can move him all around each screen, but he cannot walk diagonally. Fortunately, your character walks very quickly, so dodging ghosts isn’t too hard. Button A causes your character to shoot his proton gun at ghosts. Button B causes your secondary character (whom you do not have direct control over) to open the trap. In order for you to trap/kill the ghosts you encounter, you have to keep zapping the ghosts until your partner puts himself in position to open the trap near the ghosts. Most of the time, your partner stays right near you to trap the ghosts right after you zap them, but sometimes he’ll wander off or get stuck on a barrier, causing you to have to stop zapping and go get him. Zapping and trapping ghosts is the name of the game. Music and Sound: Great music in this game. 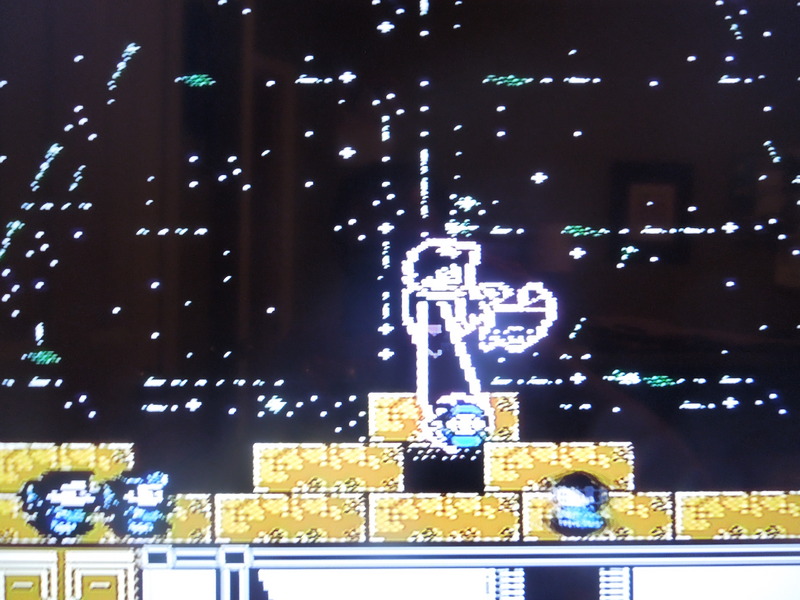 Each Round has a different song, and you’ll immediately notice the Ghostbusters theme upon turning on the game. The sound effects are great too, from the zap of your proton beam, to the train whistle in the subway station, to the cackling of ghosts. 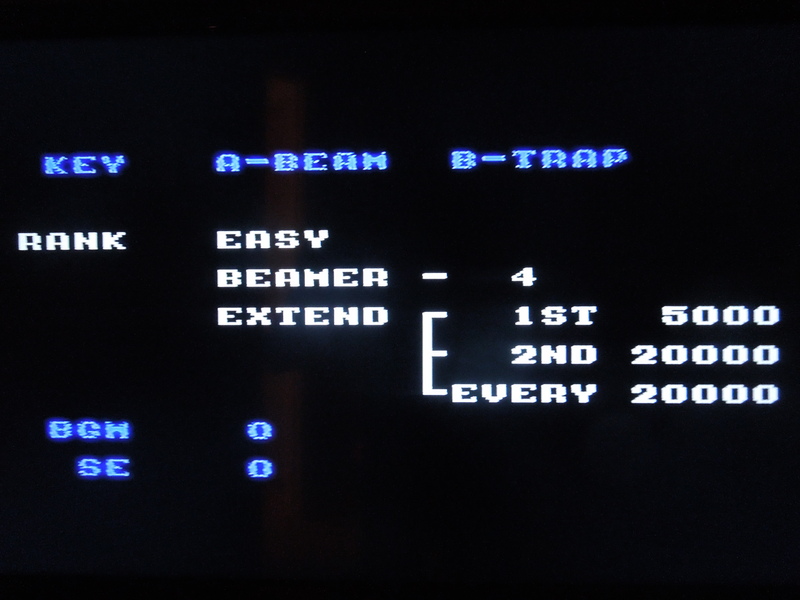 Code: Holding A + B at the title screen pulls up a hidden options menu, allowing you to listen to the different songs and sounds from the game, change the difficulty from its Normal setting to Easy, Hard, or Pro, and change up the button layout for zapping and trapping. Changing the difficulty allows you to give yourself more or less lives based on which one you select, and this also affects how often you gain extra lives (you gain extra lives by zapping ghosts and earning points, and you gain extra lives by reaching certain point totals). I really like the ability to change the button layout, as the game (for me) is much easier to play with the zap button assigned to button B and the trap button assigned to button A, as opposed to the default setup. 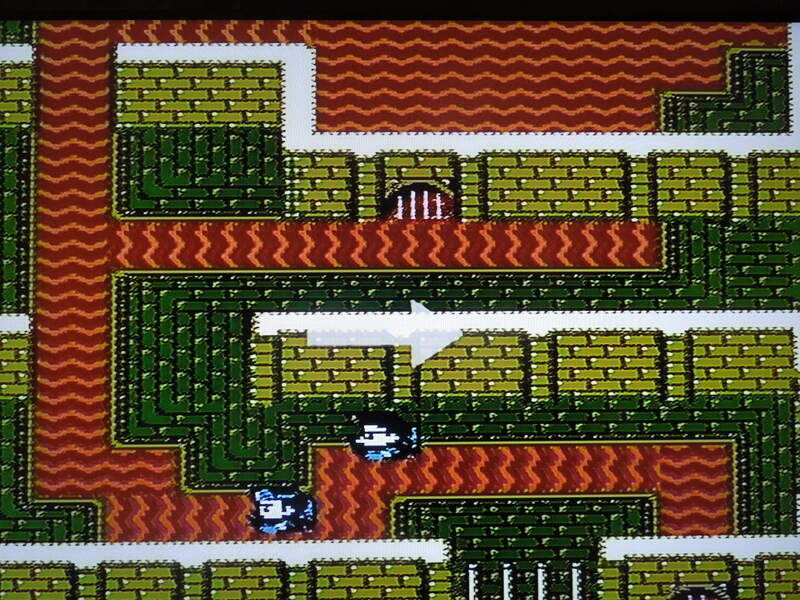 A hidden options menu is accessible by pressing A+B on the title screen.A hidden options menu is accessible by pressing A+B on the title screen. No 2 player co-op? Sadly, no. I’m not sure why, either, as it seems like this would have been easy for the developers to implement – simply give control of the second character to a human player. I have read elsewhere that a second human player CAN control the ‘trap’ by pressing B on the second controller; I tested this, and it does not work. This game is a 1-player affair. Difficulty: The learning curve isn’t steep, but it will take you some time to learn the boss fight’s nuances. You get 3 Credits to beat the game, but expect to practice and hone your skills before being able to master this one. Scenes from the movie play out well in New Ghostbusters II. Conclusion: I have never played the Ghostbusters II by Activision that WAS released in the U.S., so I cannot give a comparison of that version to this one. However, I don’t think the U.S. Activision version was well-received from what I’ve read. What I do know is that New Ghostbusters II is a really, really fun game, and, if you’re familiar with the film, you’ll recognize a lot of things from it in the game. The music is fantastic, the control is spot on, the look of the game is wonderful (kind of reminded me of overhead games like Zelda: A Link to the Past), and the gameplay is simple, yet addictive. The difficulty (even if you set the game to Easy in the hidden options menu) is perfect to – practice, perseverance, timing, and accuracy are all required to beat the game. The only negative I can really find is the lack of a 2-player mode. 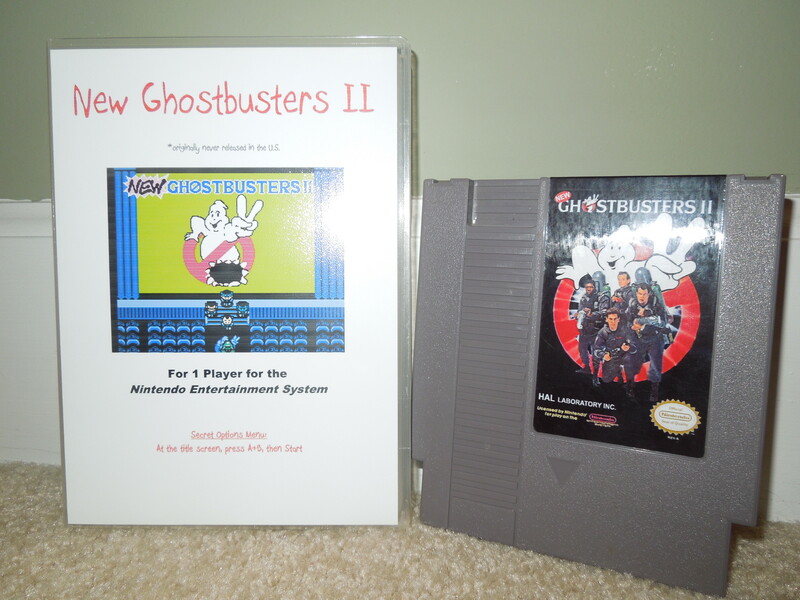 This entry was posted in NES - New Ghostbusters II and tagged New Ghostbusters II NES Review. Bookmark the permalink.